Sometimes different is good. 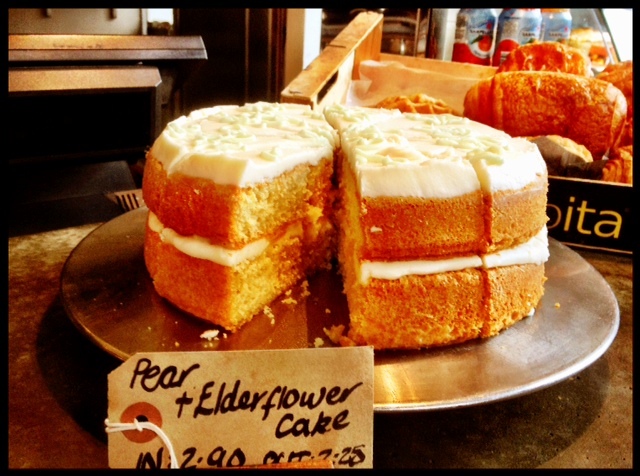 Pear and Elderflower cake? It’s 2:00pm – well past lunchtime. Lack of food starts to affect any ability to make decisions. After wandering aimlessly we meander down Cresswell Lane where we are rescued by Rudis. Cool and inviting, we happily go in, collapse into our seats and survey the menu. Toasties, panini’s salads, sharing platters are all there for the eating – and that’s exactly what we do. But it’s the amazing selection of cake that truly lures me in – my squeals of delight send my boys running to investigate. Banana and Pecan, Chocolate and Beetroot, Victoria Sandwich, Carrot and Pistachio all crying out to be devoured. And who are we to say no to delightful sweet treats – especially when it’s going so quickly. 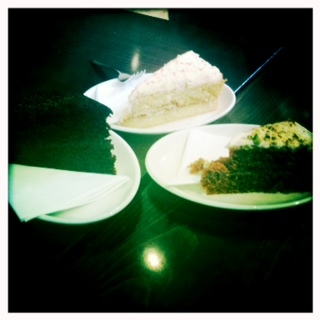 Our huge slices of cake are delivered to our table and silence follows. Mouths are moving but only to demolish the moist, sweet and gooey deliciousness. But Rudis isn’t just about wonderful cakes, it’s a relaxed, welcoming space offering fantastically priced food ( £3-5 for lunch dishes) with equally helpful staff. And after 6:00pm you can Bring Your Own bottle. Sweet never tasted better.